'Miracles of Life' opens and closes in Shanghai, the city where J.G.Ballard was born, and where he spent the most of the Second World War interned with his family in a Japanese concentration camp. J.G. Ballard was, for over fifty years, one of this country's most significant writers. Beginning with the events that inspired his classic novel, "Empire of the Sun", in this revelatory autobiography he charts the course of his astonishing life. 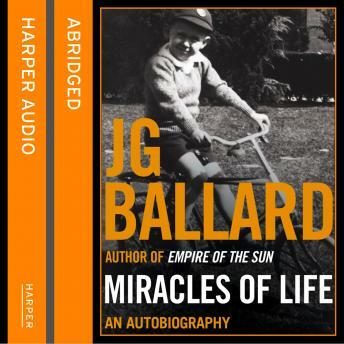 "Miracles of Life" takes us from the vibrant surroundings of pre-war Shanghai, to the deprivations and unexpected freedoms of Lunghua Camp, to Ballard's arrival in a devastated Britain. Ballard recounts his first attempts at fiction and his part in the social and artistic revolutions of the 60s. He describes his friendships with figures as diverse as Kingsley Amis, Michael Moorcock and Eduardo Paolozzi alongside recollections of his domestic life in Shepperton - raising three children as a single father following the unexpected and premature death of his wife. "Miracles of Life" is both a captivating narrative of the experiences that have shaped this extraordinary writer's works, his distinctive outlook and his original visions of the future, and is also an account of a remarkable life.